Excellent location right of Route 66! Well cared for 3 bedroom 2 bath home built in 2005. 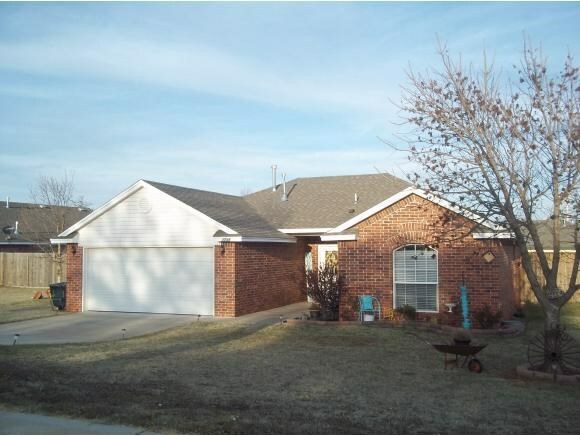 Conveniently located minutes from downtown Clinton, OK and a stones throw to Neptune Park. This property features a multi-function security system, GE reverse osmosis water filtration system, beautiful arched windows, vaulted celings, 2 car garage, large back yard with wooden privace fense, & a large wooden deck perfect for summer bar-b-q's. Jamie Rodebush joins United Country Heard Auction & Real Estate as a Broker Associate. Jamie is a native Oklahoman and moved to Western Oklahoma in 2014. She received her real estate license in 2014 and earned her Broker's license in 2018. Jamie has gained experience in real estate through hands-on activities. Previously renovating 6 homes has truly let her see the buying and selling of homes through the eyes of the client. Jamie and her husband, Rock, own the Redland Theater and are transitioning it into a bed and breakfast. Jamie and Rock have 3 girls, Jolee, Jaycee, and Rhylee. As a family, they opened Tornado Snow Shave Ice in Clinton. The children are involved in the business as a way to help instill a sound work ethic. Being involved in her local community is very important to Jamie; she is a member of the Clinton Rotary Club and the Clinton Chamber of Commerce.